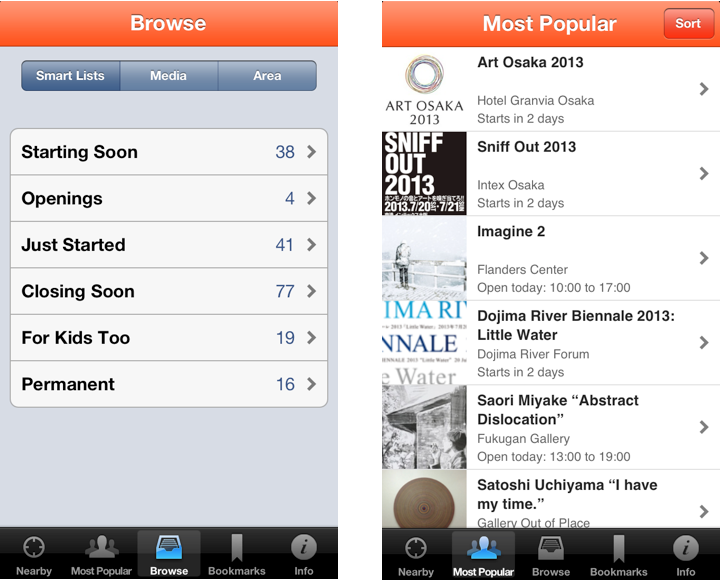 Introducing the Kansai Art Beat Official iPhone and iPod touch app! 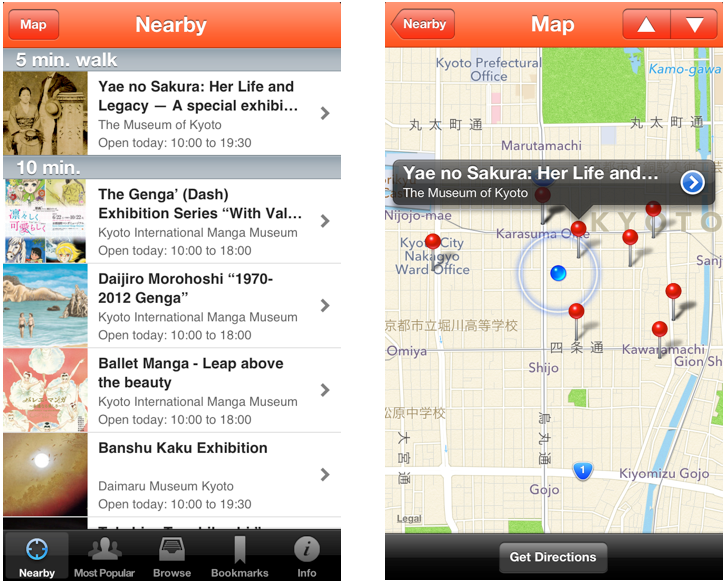 The Kansai Art Beat app for iPhone and iPod Touch is out now! The Kansai version of the mobile service made overwhelmingly popular by the Tokyo and New York chapters of Art Beat is ready for download, giving you a fast and easy way of getting information on the latest art and design events in Kansai. When you’re out and about, the KAB app provides a list of events going on near you, helping you enjoy more of the Kansai art scene as part of your daily routine. If you’re thinking “where should I go today?” just reach for the phone in your pocket for instant access to hundreds of event listings. You can search by area or genre, or browse our Smart Lists for info about events that have just started, as well as those that are closing soon. The Most Popular tab gives you a quick overview of the most notable events of the moment, ranked according to user feedback on the KAB website. With the KAB app, you’ll never miss another event. Simply use our bookmarking function and keep a list of all the events you want to see in one place, ordered by the dates that they close. 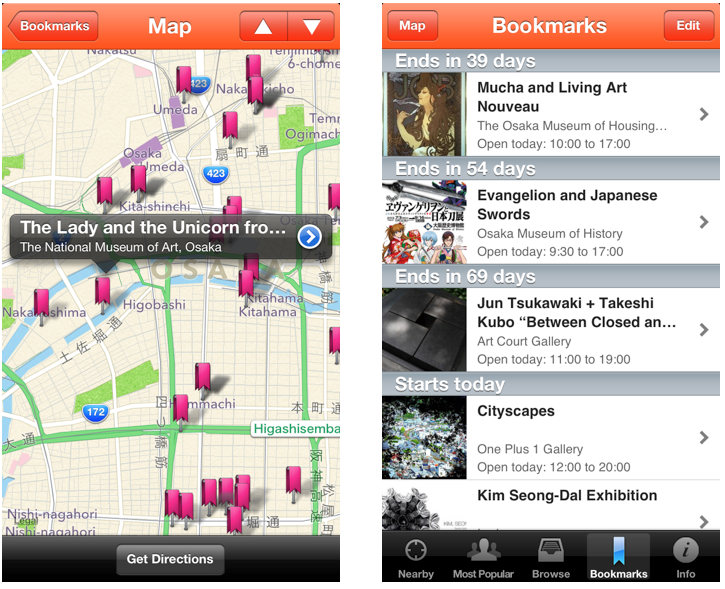 You can also find a map showing the venue locations of your bookmarked events to help you plan your trip. So, what are you waiting for? Download the KAB app and click on the Nearby tab to find out what art events are happening nearby today! We are sure you will be blown away by how many art events are going on around you on a daily basis that you had no idea about! Have the great Kansai art scene become a part of your lifestyle! Project announcements and news from behind the scenes at Kansai Art Beat. The views expressed on KABlog are those of the author and do not necessarily reflect those of their employers, or Kansai Art Beat, or the Gadago NPO.